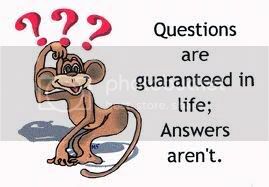 Share Good Stuffs: Tricky Interesting questions ??? Below are four (4) questions and a bonus question. You have to answer them instantly. You can't take your time, answer all of them immediately. OK? your answer may be: first!!! but the correct answer is: If you overtake the second person and you take his place, you are second! "Try not to screw up in the next question. To answer the second question, don't take as much time as you took for the first question." Second Question: If you overtake the last person, then you are...? your answer may be: second to last!!! but the correct answer is: Tell me, how can you overtake the LAST Person? "You're not very good at this! Are you?" "Very tricky math! Note: This must be done in your head only. Do NOT use paper and pencil or a calculator. Try it." your answer may be: Did you get 5000? but the correct answer is: The correct answer is actually 4100.
your day. Maybe you will get the last question right?" 4. Nono. What is the name of the fifth daughter? your answer may be: Nunu? Now, The bonus Question: There is a mute person who wants to buy a toothbrush. By imitating the action of brushing one's teeth he successfully himself to the shopkeeper and the purchase is done. Now if there is a blind man who wishes to buy a pair of sunglasses, how should he express himself??? correct answer is: He just has to open his mouth and ask, so simple.